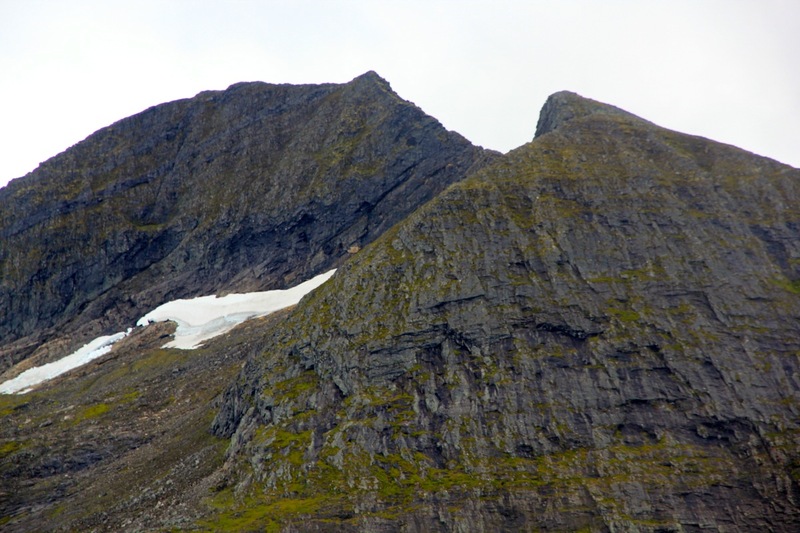 This mountain is located east of Ålesund, access is easy from Hwy E39 running from Ålesund towards Molde. More precisely, locate the small village of Sjøholt, where Hwy. 650 forks south to Stordal (direction towards Stranda). Measure from this intersection. First, go 7.6 kilometer along Hwy. 650, then turn left, the sign says "Vaksvikfjellet 4". Continue along this more narrow, but paved road to kilometer 12.0 where the pavement ends. Continue straight on a reasonably good dirt road to kilometer 13.1, turn right here and pay toll at the self serve station (NOK 20 for one day in 2013). Drive to kilometer 14.5 where there is good parking at Grytalisætra. This is the trailhead, location N62.44717, E007.01914. Elevation about 400 meter. Continue a few meter along the local road serving the last buildings, then fork left. There is a sign here pointing left and saying "Lauparen". The trail is in frequent use and easy to follow across meadows and then crossing a small creek. 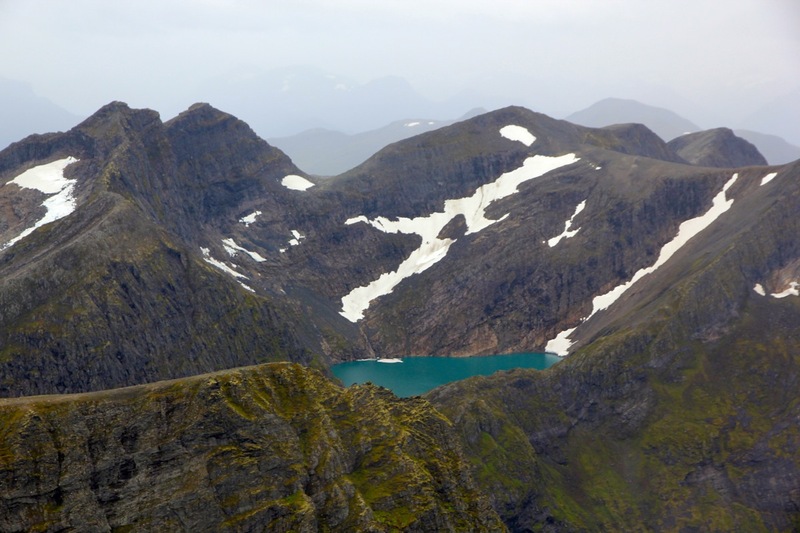 Next, along this creek and graually gaining elevation heading towards the lake Grytavatnet (654m). 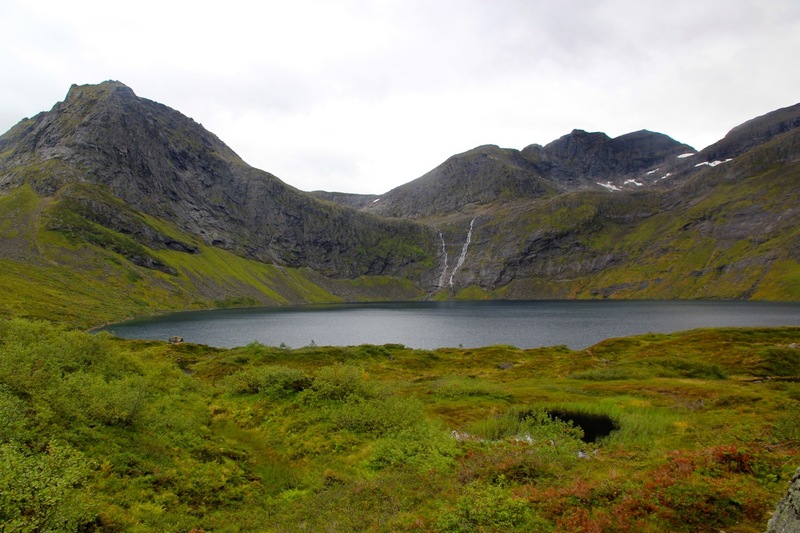 The trail runs on the (left) north side of this lake into a bowl and the south ridge of Lauparen is finally in view. Gain the saddle below the south ridge. Next, the trail runs in several (local) variants, zig-zags up the ridge. Shortly before the summit, the trail heads a bit left, however, be aware that there is a false trail that runs off to the left side. The route stays pretty much in the center and you should look for a narrow gully (with an iron hand rail) that provides access to the very upper part. This short pitch is quite easy and the hand rail is not really needed. 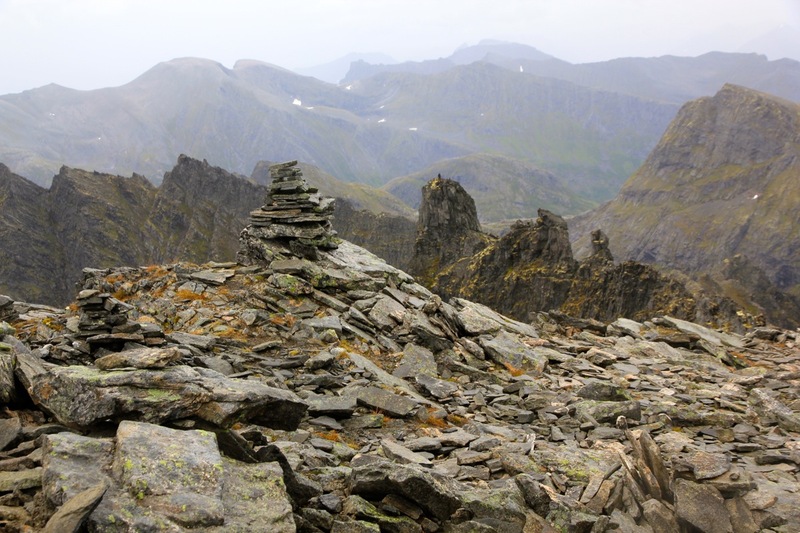 Above, the easiest route stays a bit left then gains the summit with a register and a really enormous cairn. I had been in Molde celebrating the diamond weeding anniversary (60 years!) of Heidi's parents. 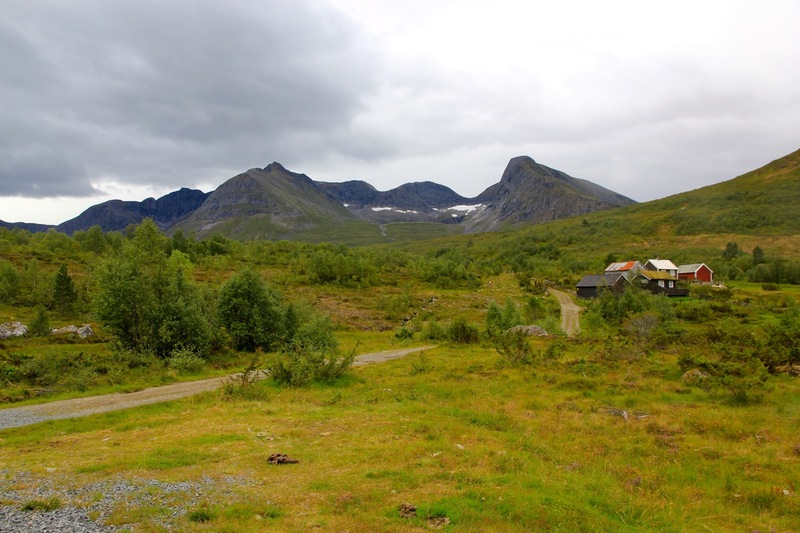 I left Molde after breakfast and arrived at the trailhead around 1000. After changing clothes, I left at 1015. It was raining and the weather looked less than good. Fortunately, the rain stopped as I gained the col below the south ridge around 1150. The ascent was straightforward, but then I took the false trail leading left all the way to the proper west ridge of the peak. Further progress here looked like climbing and I understood that I was off-route. 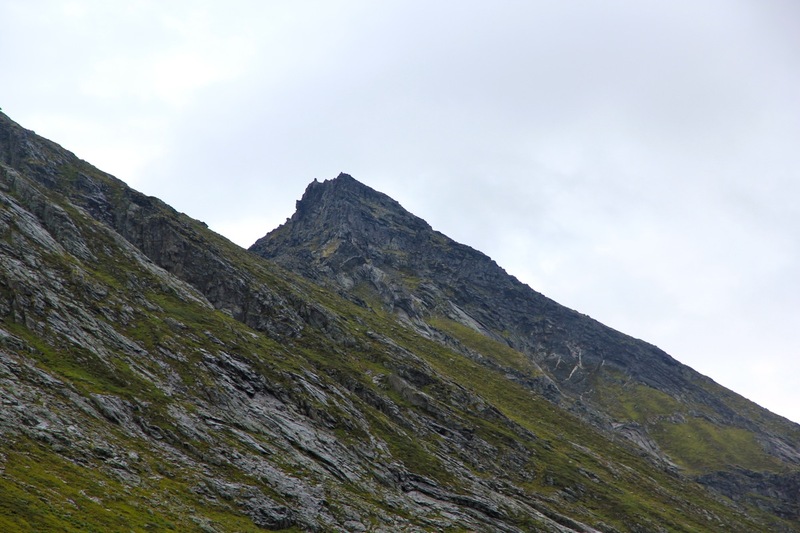 Going back, I quickly discovered the correct route and gained the summit around 1245. Clouds everywhere, but some view still. I left the summit at 1300, just as it started to rain again. On my return hike I met two parties each two people. Even in this kind of weather the locals do hike here. As I got back down to Grytavatnet, the rain stopped and the weather looked much better (although no sunshine). I was back at 1500 sharp, and the rain started again by 1505. My next goals were a hamburger meal at Sjøholt, then an easy drive to my friend Arnt where I was given a warm welcome by him and his dog Karma whom I had not seen before. 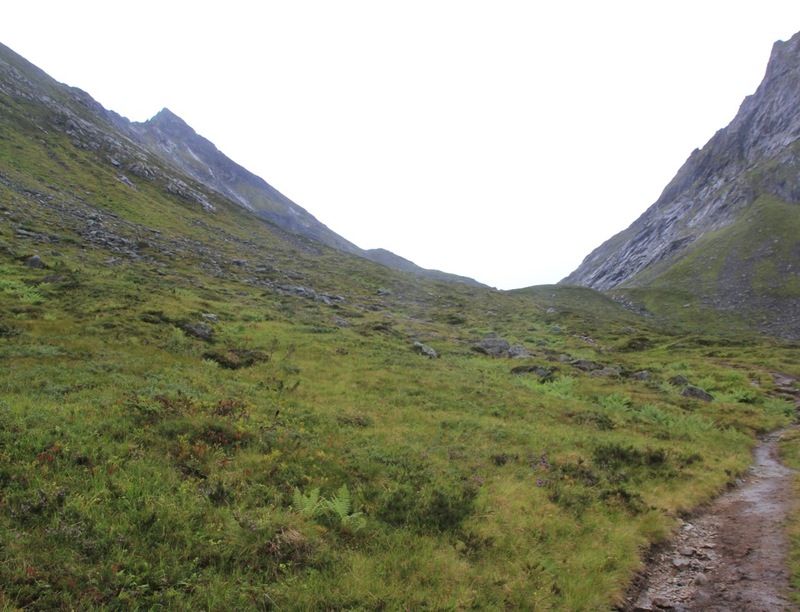 View from the trailhead, towards Sandegga, south of Lauparen. 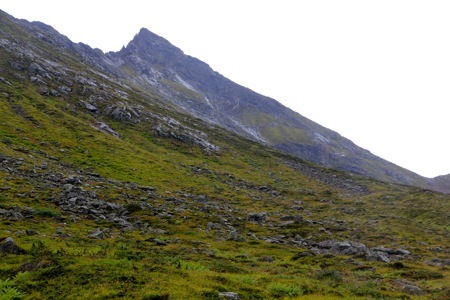 Lauparen, the south ridge, as seen from the trail. 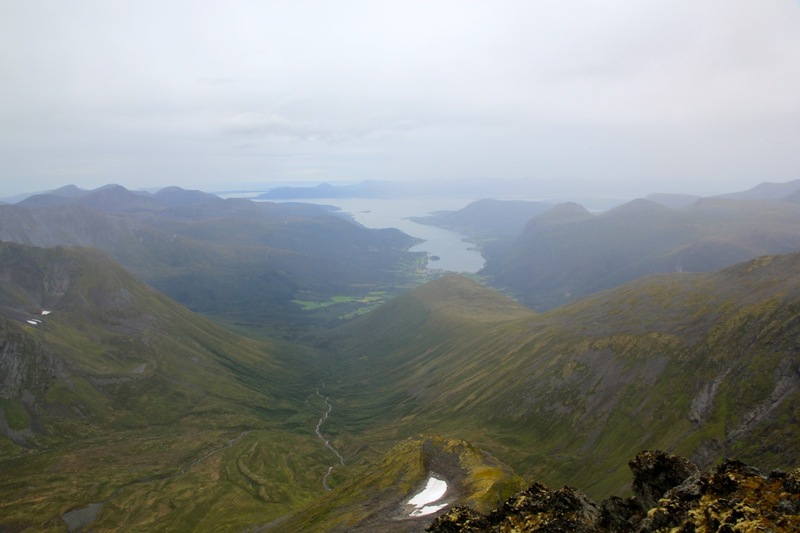 Summit view north, Tresfjorden, Vestnes (Molde way back). Summit view east, the jagged east ridge. Summit view south, lake 937, Isbotnen. 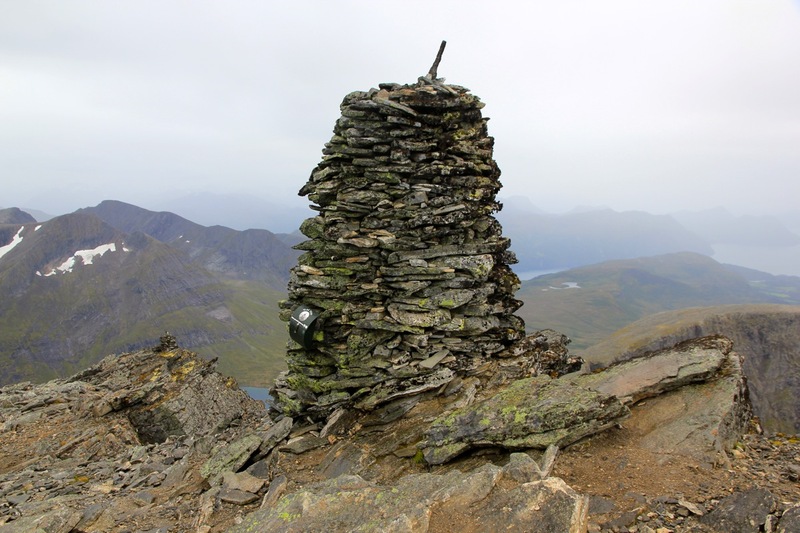 Summit view south, Fremste Skorka, 1302m.